A spill on the floor can be an easy thing to miss, but as this case study indicates, it can result in a serious outcome for a venue. This case study implies that there is a possible failure in OHS systems whereby a person has slipped and suffered a serious injury as a result of the ‘slip hazard’ from a spill on the floor of the venue. From a health and safety perspective, this case study raises a few questions for debate. A Queensland woman is seeking more than half a million dollars in compensation after slipping at a venue. Person (A) had filed documents in the District Court saying she had fallen in a venue in 2008 and dislocated her right knee. Person (A) says the slip left them with permanent knee damage and they have been unable to return to work. Person (A) has undergone three rounds of surgery and suffers constant pain from the injury, the statement of claim says. Person (A) is seeking more than $500,000 in damages from the venue. Person (A) has stated that the venue was negligent because it did not take reasonable steps to prevent injury. Where did the spill originate from? How long was the spill on the floor for? Why wasn’t the spill cleaned up as soon as possible? Was there a procedure in place at the time for persons cleaning up or managing spills? Did workers understand the procedure for cleaning spills? If there was a spill clean-up procedure, how were workers assessed in their competency that they understood the spill clean-up procedure? Were there an adequate number of workers who could have attended to the spill? What controls were in place to mitigate the risk of injury from the spill? What was the intent of the person who slipped on the spill (i.e. was it a premeditated act)? Was the person on medication that may have affected their motor skills or their ability to make an informed decision (i.e. grasp on to something) to reduce the impact of the fall and mitigate the severity of the injury? Did the Venue have sufficient lighting where the spill was situated? Was there a culture of health and safety at the workplace? Under the Federal Health and Safety Laws, it could be strongly argued that health and safety was notensured to prevent an injury from occurring, and that the venue failed in their primary duty of care under s.19 of the Work Health and Safety Act 2011.Furthermore, workers who have health and safety duties under s.28 Work Health and Safety Act 2011 will need to comply with any instruction, policy and procedure that has been provided to them which is reasonable (i.e. in this case, it could be cleaning up spills as soon as possible and managing the spill area to ensure persons are not exposed to the slip hazard). If they breach their health and safety duties, then they too can be up for severe penalties under the Act. 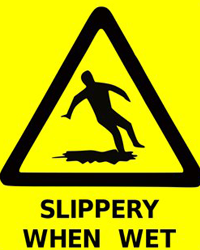 Slips are often regarded as a minor ‘accident’ and are occasionally laughed off by the patron, however slips should never be taken lightly by management and staff. If this venue had an adequate safety system in place, you could assume that they would have implemented the procedure to ensure that the spill was managed in an appropriate timeframe. We can all learn from cases like this which demonstrate the need to have strategies in place for all workplaces to mitigate or eliminate risks. This would mean ensuring as much as possible that procedures (such as cleaning up of spills) are adequately enforced, and workers are aware and understand the process. This procedure would need to be developed in consultation with employees, who are then trained in this procedure and so that they are able to show understanding of this and their responsibility. Another important note is that this incident occurred prior to the new Work Health and Safety Laws introduced earlier this year. If we place this case study under the current Work Health and Safety Act 2012, the outcome could be even more severe and the financial penalties for the venue could be increased. Venues should develop and implement a Safety Management System that is appropriate for their workplace and integrate it with other systems and core functions to ensure that potential risk situations are managed at all levels and at all times. Already have a safety management system in place? Ensure your safety management system assists the venue to meet its legal responsibilities by engaging a certified OHS auditor to conduct an audit on your safety management system assessing its overall performance. Ensure your staff have a thorough understanding of their role in the safety management system. Policies and procedures are of no use on paper alone, they need to be actively promoted and enforced by the employer. Consulting staff during the development of safety procedures and then conducting training staff on these procedures will go a long way to integrating health and safety in your workplace’s culture. DWS Risk can help your venue with everything from professional advice, to the development and implementation of an entire Safety Management System.